Each of the different 1968 Shelby models uses a different set of exhaust manifolds. 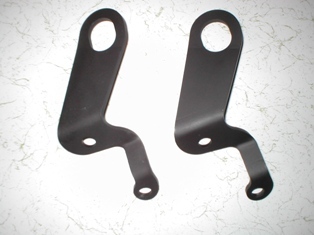 I have also included information about the lift hooks. Engine lift hooks were used by the factory to install the motors and were left on the cars. They were bolted to the exhaust manifold and are frequently discarded during normal maintenance. 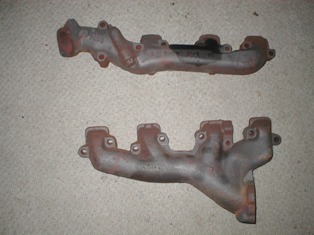 Here are the GT500 KR exhaust manifolds. They have a unique shape. This is an original set of 1968 manifolds. Later manifolds differ slightly and are fully interchangeable. All Cobra Jet manifolds are 2 1/4 inch diameter. 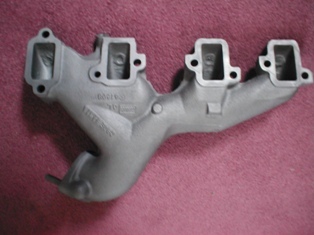 If you have a clean set of manifolds you will find the casting date. You may be surprised to know 1968 Cobra Jet cars used two small lift hooks. I commonly see the large hook used, but believe the factory didn't start using the larger lift hook until 1969. 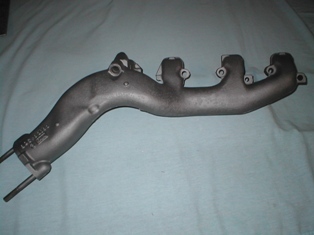 The GT500 exhaust manifolds are standard 428 parts. These manifolds are 2 inch parts. Even though the GT500 and the GT500 KR have the same sized engine, the lift hooks are considerably different. These are the GT350 manifolds. They are the same as all 1968 302 engines. The size is 2 inch. The casting numbers are "C60E-9430-F" and "C60E-9431-F". The GT350 uses the same exhaust as the GT500s from the manifolds back. Ford used a couple different types of clamps during the 1968 production model year. This is a typical clamp. This clamp is a reproduction with the FoMoCo stamped trademark. Each car would have used six of these clamps. Two on the front and four on the muffler. The clamps came in two sizes, depending on your engine displacement. GT500 KRs used the 2 1/4 inch clamp, all others used the 2" clamp. This clamp is unique to the GT350s and GT500s. It is referred to as a "horse shoe" style clamp. It was used to clamp the chrome, tail pipe tips to the tail pipe. This is an original exhaust tip on a GT500. The GT350 uses the same clamped, exhaust tip. Properly installed these should extend out the rear valence by several inches. The measurement will vary depending on how the muffler is positioned, but this one is about 3 3/4" long. The GT500 KR has chrome tips that are welded to the tail pipe. The extra "horse shoe" clamps are not used. This is an original GT500 KR tail pipe. The chrome tip is welded in "v" pattern and the tips have a rolled edge. This anchor is mounted behind the rear seat. The studs go through the floor pan and provide a mounting place for the pipe hangers. A small screw goes through the center hole into the floor. These are the hangers for the long pipes. All Shelbys used the same hangers. There is a left hanger and a right hanger. These are nice reproductions. This is a picture of the hanger for the tail pipe. The tail pipe is anchored to the rear frame rail. 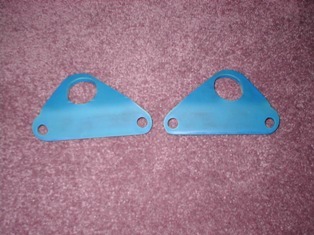 On the right is the bracket and insulator. Original brackets have rounded edges. Original insulators often have raised identification numbers in the rubber. I have also seen stamped numbers on service replacement insulators. Both of these parts originally had small trademark stampings. On the left is the pipe strap and u-bracket. Notice the pipe strap is narrow in the center and wider on the ends. A large phosphated, lag screw holds the clamp together. The size of the strap will vary depending on your engine displacement. According to the assembly line drawings the straps have a specific orientation when installed. I believe this is to prevent the lag screw from puncturing the fuel tank. I have actually seen many straps that are welded to the u-bracket as shown above. The orientation was ignored. Here is another view of the bracket and insulator. There are four of these carrige bolts to mount the tail pipe, hanger bracket to the frame rail. They were originally phosphated. I have also seen a hex headed bolt used in it's place on some cars. This bracket is for the right frame rail.